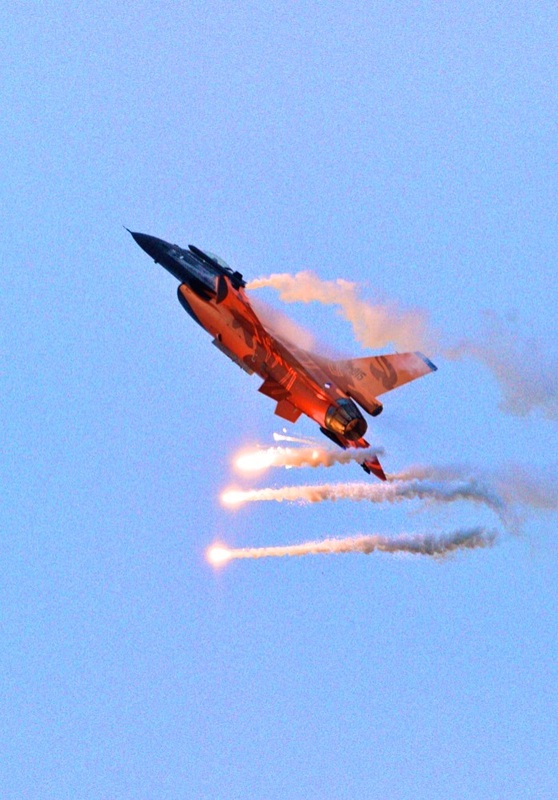 This shot of a Royal Dutch Airforce F16 Fighting Falcon was taken at the Bournemouth Air Show, 2010. I love the way that the flares, having just been dispensed from the jet, are close enough to light up the underside of the fuselage. The air show is extremely popular and attracts thousands every year. I chose this show to experiment with some of the settings for my Nikon D700. In particular, I was looking to come up with the best combination of settings for capturing fast moving flying objects, like birds (or jet aircraft), since I had had mixed results in the past. The next time I had a Sea Eagle in my viewfinder, I wanted to be sure of getting some sharp shots! I experimented with Shutter- and Aperture- priority exposure modes, and also with the various auto focus capabilities of the D700. I found that the 51 point 3D Dynamic area mode, and the Auto area mode, both produced excellent results – with even very fast moving objects moving in 3 dimensions, they locked onto and accurately tracked the target. This, combined with Continuous servo autofocus, Aperture Priority metering, and a high-ish ISO of 800, gave me pin sharp results with plenty of detail at long range. I was very impressed, especially considering the dull quality of the light that day. The camera was obviously seeing things that I couldn’t! Another little experiment that day produced some very unexpected results. I was using the Nikkor 300mm f4 lens – an excellent lens, very sharp, and light enough to be very transportable and hand holdable. However, sometimes, 300mm is just not enough reach, and anything bigger, (e.g. 600mm f4, or even 400mm f2.8) is just too big and heavy to hand hold for any more than a shot or two. So I occasionally use teleconverters – the excellent TC14 II and the TC20 II (which I have now replaced with the Mark III version). The TC14 was supposed to work with the 300mm f4, and it did, but the TC20 was not supposed to work. Being a x2 teleconverter, that would mean a two stop loss of light through the lens, resulting in f8 at best. All the official literature said that this was just not enough light to make autofocus possible, so it would have to be manual focus only. Now, I don’t know if any of you have tried hand holding a long telephoto lens and trying to manually focus it on a fast moving subject, but it is not something I personally have ever had any success with! Imagine my surprise, therefore, when I plugged the TC20 II teleconverter onto the 300mm f4 and found that it happily, and rapidly, auto-focused on the target and continued to do so, producing sharp results every time. I have since quizzed as many Nikon experts as I could about this, even at Nikon UK, and they all say this shouldn’t be possible with that lens/teleconverter combination. But it was!